If you are reading this article, it means you really want to get rid of MyLoginBox. This adware program must have been installed on your computer accidentally, and now it is causing quite a lot of mess, is it not? The good part about adware programs is that they are your immediate system security threats, and they cannot cause an ultimate system crash. On the other hand, MyLoginBox may inadvertently lead you to dangerous sites that are part of malware distribution networks. Although that kind of turn of events is very unlikely, you should not take your chances. If you care about your safety, you will have MyLoginBox removed right now. Normally, adware programs have dysfunctional websites that do not work properly, and the direct download links are dead. However, that is not the case with MyLoginBox. You can access the official website for this program via myloginbox.com. If that were not enough, it is also possible to download the application from the main website. All you have to do is click the green Download button. On the other hand, that is clearly not the only manner of distribution employed by the application. 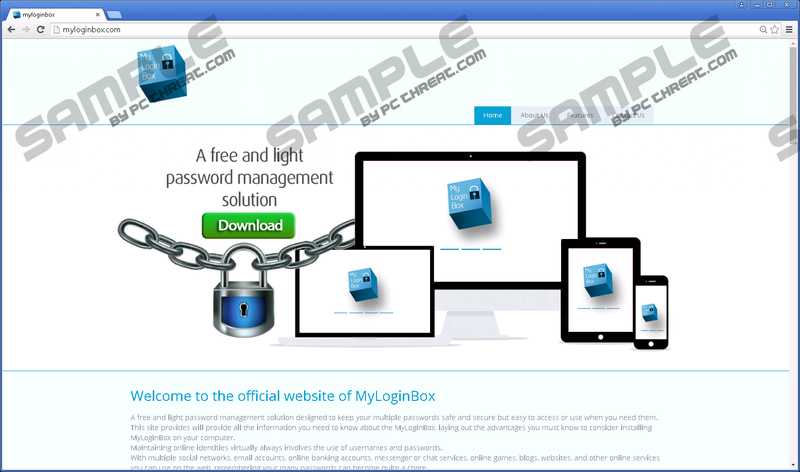 MyLoginBox may also come bundled with freeware, especially when you download something from a file hosting website. This implies that you have to be responsible for your own safety and do not just download anything you see on the Internet. Think twice before you click that button! What is MyLoginBox all about? Well, judging from the official website, the program supposedly offers you “a free and light password management solution.” According to the information provided on the main page, MyLoginBox has been “designed to keep your multiple passwords safe and secure but easy to access or use when you need them.” In other words, the application should remember all of your logins and passwords for you. The question is, however, whether you could trust a third-party application with such sensitive information when the program cannot even protect itself from third-party exploitation. Third-party exploitation is the main reason users are always advised to remove adware applications ASAP. Since the programs do not check what kind of content gets embedded into their ads, it is very easy for cyber criminals to promote their sites and programs via MyLoginBox ads. You may not even know that you are being exposed to potentially harmful content until you actually click on it. This is where everything can go down the hill. As mentioned, the possibility is not big, but it is there, so if you do not want to get infected with adware, please uninstall MyLoginBox right now. Open your Control Panel and make sure you remove this and other unwanted applications as well. If you are having a problem trying to identify all the potential security threats, you can always acquire a powerful antispyware tool that would do the entire job for you. Automated spyware removal is always the most efficient way to deal with the problem at hand. Not to mention that this way you would also protect your PC from similar threats in the future. However, do not forget that exercising safe web browsing habits also plays a pivotal role in ensuring your system’s safety. Enter “control panel” and press OK. Highlight MyLoginBox and click Uninstall. Select Uninstall a program and remove MyLoginBox. Access Add or remove programs and uninstall MyLoginBox. Quick & tested solution for MyLoginBox removal.